Revive™ products contain unique combinations of carefully chosen strains of probiotics, prebiotics, enzymes, and a specific type of concentrated yeast extract. They are designed to rapidly establish and promote a healthy gut population - heavily weighted towards exceptional fiber digestion. 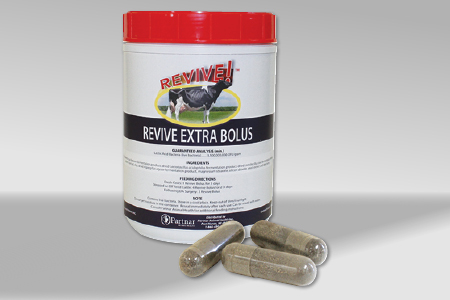 The Revive™ Extra Bolus is a bacterial package specifically formulated to provide and promote a healthy rumen population in cattle. Use it in individual cattle that are under stress due to freshening, health challenges or environmental challenges. 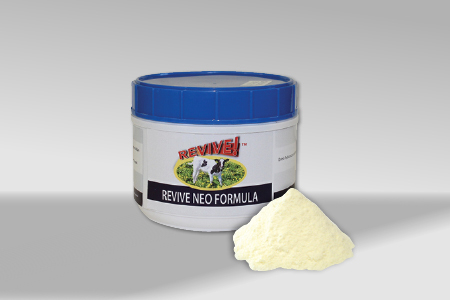 The Revive™ Neo Formula is a powder designed to easily dissolve in the milk, milk-replacer or water being fed to calves. Use it to establish and maintain a healthy gut microflora to promote a natural line of defence by the calf. A healthy gut allows for better feed conversion which results in more rapid weight gain and healthier calves! 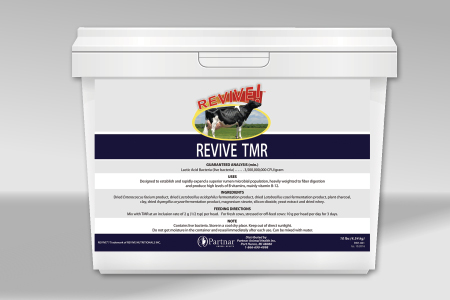 ​Revive™ TMR is designed to establish and rapidly expand a superior rumen microbial population, heavily weighted to fiber digestion and produce high levels of B vitamins, mainly vitamin B-12. © COPYRIGHT 2016. Partnar Animal Health Inc.
REVIVE™ is a Trademark of Revive Nutritionals Inc.